and Water Technology” Energy-Efficient Infrastructure for Smart Cities Masters programme has been developed through collaboration with partners from the University of Strathclyde (Glasgow, UK) under the FP7 project STEP-UP – Strategies Towards Energy Performance and Urban Planning. 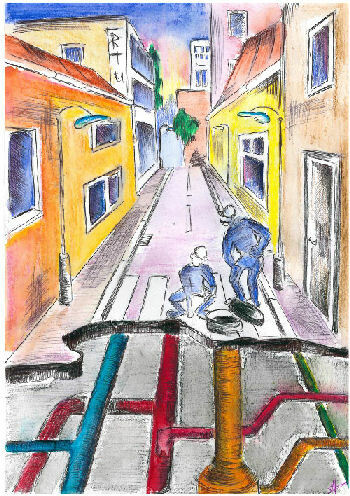 The degree provides graduates with the skills to design, install and operate building and city infrastructure engineering systems; to identify factors and risks which can affect quality of building and city infrastructure engineering systems; and to support both cities and utilities in planning and implementing cross-sector solutions for smart growth. The MSc in “Energy-Efficient Infrastructure for Smart Cities” provides the opportunity to start training graduates with economic and humanitarian basic education. In this case the diploma alignment stage is developed with an individual training plan during the first stage of study (with an additional 6 months diploma alignment stage). The MSc is designed to provide students with knowledge about city planning, infrastructure management, urban economy and social services, local regulations, national laws, EU policies, the urban environment, resilience and safety, urban transport, electricity and heat supply (12 months). The degree is delivered through a range of lectures, workshops, group discussions, case studies, presentations and independent studies. Achieving sustainable growth and urban resilience are growing concerns; this programme addresses these challenges by providing both public and private sector employees with the skills and techniques to develop and implement innovative city projects. Build a career in engineering as a city infrastructure specialist, as well as continuing in education and research through doctoral studies.